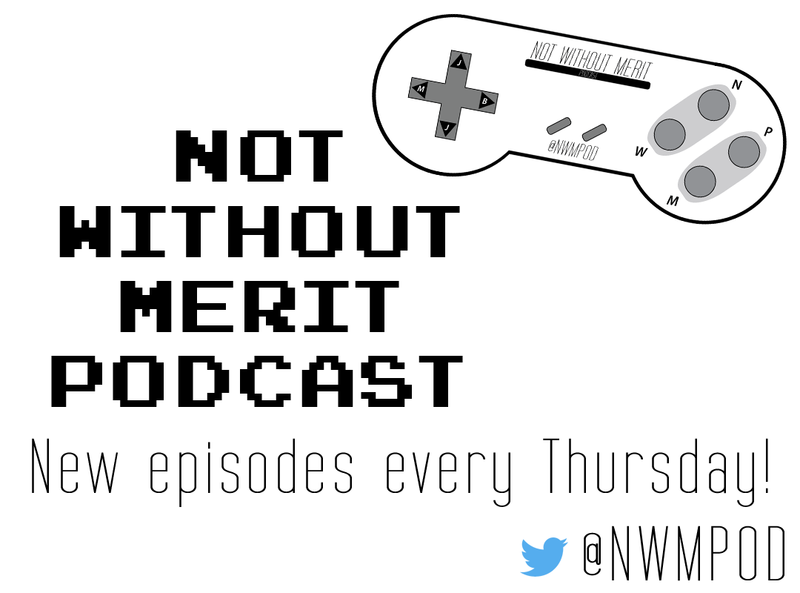 Not Without Merit Podcast – Page 12 – It's a video game podcast! Mike gives an update into his heavy XCOM 2 addiction, and performance issues aside, he is in love. Jake has made a return to Warframe just in time for the upcoming expansion. Ben has started South Park: The Fractured But Whole with a positive experience so far. Sad news leads this week as EA shuts down Visceral Studios, leaving their upcoming Star Wars game in limbo, Sony announces a Battlefront 2-themed PS4 Pro as well as a new controller, Rocket League reveals a Halloween event, a release date is given for Doom on Switch and Star Ocean 4 in the West, and a new counselor and map arrive in Friday the 13th. For the Top 5, we talk about our favorite boss fights! We are in the heart of fall beta season as all of us report back on the Star Wars: Battlefront 2 beta, while Mike has spent some time trying out the Gran Turismo Sport beta. Jake has finished Assassins Creed: Syndicate, thoroughly enjoying the game, and Ben has reach the peak ranks of Everybody’s Golf, and boy is it tough to be at the top. Even in a slow news week, Hitman announces an announcement for October 24th on new content for the game, Destiny 2 has delayed the Prestige difficulty of the raid due to recent exploits, Ghost Recon: Wildlands gets another free trial to show off their new PvP mode, and Star Ocean 4 is being remastered for PS4 and PC! For our Top 5 (or 8) we rank the Star Wars movies! Jake has finally finished Mass Effect: Andromeda, and is very disappointed with the experience. Mike started XCOM 2 and is foolishly optimistic about his future success. Ben has gotten the Platinum in Destiny 2, but shows no signs of slowing down. In news, we get release dates for Stardew Valley on Switch, Nioh on PC, a Game of the Year Edition for Horizon: Zero Dawn, and more Fast & Furious DLC for Rocket League! Also, more PS2 and PSP Rockstar games will be coming to the PS4, Sony reveals an updated version of the PSVR as well as their plans for Paris Games Week. For our Top 5, we choose our favorite video game soundtracks! We keep plugging away at Destiny 2, now with much more raid success! Jake is also nearing the end of Mass Effect: Andromeda, and Mike ends his time with Mario + Rabbids: Kingdom Battle to move on to bigger challenges. In news, arguably the biggest game yet is part of October’s PS+ lineup, Golf Story finally has a release date (right now! ), a Red Dead Redemption 2 announcement is imminent, Stardew Valley is one step closer to a Switch release, Star Wars Battlefront 2 unveils a new (sort of) mode, and we theorize on what the Ataribox will be. For our Top 5, we pick our favorite Western films/TV shows! We are in week two of Destiny 2-a-palooza, and we have made it to the end of the raid (but have not finished it)! In between horrible Crucible matches, Ben has found the time to finish FFXII, Mike has started Mario + Rabbids: Kingdom Battle, and Jake continues to chip away at Mass Effect: Andromeda. Lots of announcements between the Nintendo Direct and Tokyo Game Show: Monster Hunter World has a (very soon) release date, FFIX was announced and released for PS4, Dragon’s Crown Pro was revealed, Zone of the Enders is getting a remaster and VR support, Picross S is coming to Switch, Super Mario Odyssey has a Switch bundle, both Doom and Wolfenstein: The New Colossus are releasing on Switch, and lots of new content coming for Rocket League in the Autumn Update! For our Top 5, we take a deep dive and talk about our favorite TV shows! Destiny 2 is here and we talk about it, a lot, seriously a lot. Surprisingly news did happen this past week, like a re-release of LA Noire, Season 5 rewards for Rocket League, Bruce Straley leaving Naughty Dog, and Nintendo’s Switch app is less bad now! For our Top 5, we pick our favorite weapons from the first Destiny! With the release of Destiny 2 upon us and thus doing a short version of the show so we can play more of it, we still find time for all of us to show our love for Everybody’s Golf, Jake gets some time in Rainbow Six: Siege with the latest update, and Ben continues his journey in Final Fantasy XII. News is also short and sweet with the announcement of Dead Rising 4 coming to the PS4 this December, a new Jackbox Party Pack is coming in the future, and more versions of the DualShock 4 are coming this fall. Our Top 5 was cut for time, but we will be picking our favorite controllers next week!